AIDS and malaria epidemics receive much attention from international health organizations, but a sneakier killer is on the loose in Africa. Air pollution may now be the continent's number one killer, according to a forthcoming study. Susanne Bauer, an Earth Institute affiliate who models atmospheric composition at NASA's Goddard Institute for Space Studies, presented these findings at a meeting of the American Geophysical Union on Thursday. 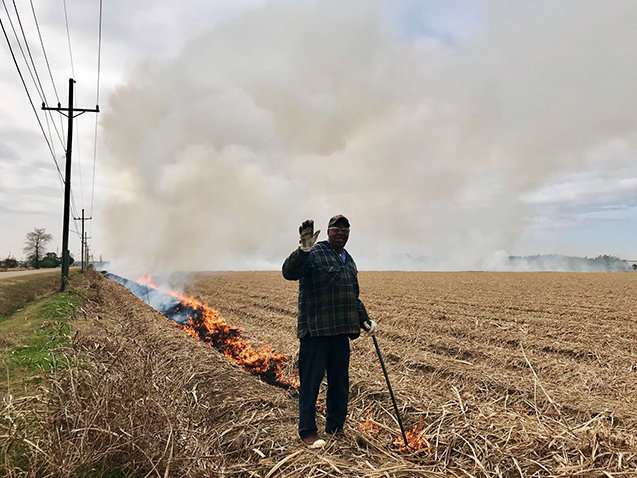 In sub-Saharan Africa, the widespread practice of burning crop residues helps to clear stubble from fields and fertilize the soil. "It's really, really cheap to treat your fields after the harvesting season with fires," explained Bauer during her presentation. But where there's fire, there's smoke. The practice releases fine particles into the air that can harm human health, and sub-Saharan Africa alone produces about a third of the planet's burning biomass emissions. Bauer and her colleagues set out to learn more about the particles' origins, chemistry, and health effects. The team used a climate model and satellite data to map where the biomass burning takes place. They tracked where the smoke from those fires ends up, and studied the distribution of gases and harmful particulates that come from other sources, such as industry and nature. Then they fed the data into an economic health model to estimate how many lives each type of pollution would shorten. The model takes into account factors such as population density, age distribution, and risk factors from other diseases. Bauer and her colleagues calculated that the largest portion of Africa's air pollution-related deaths came from a surprising source. "The biggest killer on that continent is nature, because of the gigantic dust sources around the Sahara," said Bauer. Particles smaller than 2.5 microns—about half as wide as a red blood cell—can lodge themselves in human airways. Once inside, they increase a person's risk of lung cancer, heart attack, lung disease, stroke, heart disease, and more. The team calculated that Saharan dust and other natural pollutants cause 1.2 million Africans to die prematurely every year. That's more than AIDS, which kills around 760,000 Africans per year, on average. In 2015, AIDS was unseated as the leading cause of death in Africa. It was replaced by lower respiratory infections, such as pneumonia and bronchitis, which claim one million African lives per year. By these estimates, air pollution from the Sahara is the number one killer in Africa. In addition, studies suggest that some types of air pollution are linked to respiratory infections. Industrial and urban emissions were the second deadliest source of air pollution. They claim 324,000 lives per year, according to the team's estimates. Gases emitted by vehicles and factories—such as ozone, carbon monoxide, sulfur oxides and sulfates—as well as soot and organic carbon were mostly to blame. This manmade pollution ranks between meningitis and malaria in Africa's leading causes of death. Although burning forests and fields created the largest amount of air pollutants in the study, the practice takes place in areas where population density is low. As a result, biomass burning ranked as the third largest source of air pollution-related deaths. It causes an estimated 70,000 premature deaths per year. One weakness of the study, said Bauer, is that she and her colleagues assumed all types of fine particles had equal toxicity. That may not be the case in reality. However, scientists don't know much about each particle's specific effects on human death rates. "I think it's very striking that air pollution's overall mortality is the same order of magnitude as AIDS," said Bauer. "There are a lot of initiatives to fight AIDS, to fight malaria, but air pollution is certainly under-addressed on that continent." Part of the reason for its obscurity may be that premature deaths from air pollution are hard to pinpoint. You can't diagnose them like you can for malaria and AIDS. The negative effects of air pollution can manifest in a variety of ways, and exacerbate conditions that can have multiple causes. "I don't think society understood how dangerous it is," she said. The team calculated that interventions—such as reducing pollution from industrial sources, improving land management techniques, distributing masks, and informing people about the dangers of dust storms—could save 350 thousand lives each year. Tackling air pollution in Africa will not be easy. Many nations already face political, economic, and social challenges, on top of other known health problems. But Bauer says awareness about the dangers of air pollution is growing, and that's the first step toward fixing the problem.